Kohl Svec was the high five winner during Homecoming week and is pictured with his prize. Brightly colored hands plaster the lockers of Exeter-Milligan students at both of the elementary campuses. These neon paper hands represent the "high five" program that Exeter-Milligan Elementary Principal Laura Kroll and her staff have implemented this year. When a teacher or staff member spots a student performing a good deed, behaving well or being kind, that student is given a high five note praising their behavior. The program also includes "high five's" for students who have achieved a scholastic goal. 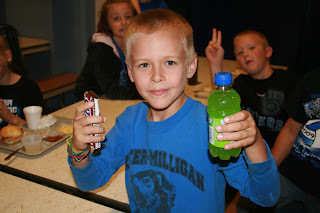 Once a week all the names of the students who received a high five during the week are entered into a drawing at each school and the student whose name is drawn gets a small soda and a candy bar. Kroll noticed so much of school discipline is negative and thought that, "Pointing out the positives is very important at all levels, but especially at the elementary level." Instead of focusing on a system of discipline that punishes students for misbehavior, Kroll hoped that rewarding students for good behavior would encourage them to look for opportunities to help others. Helping the students to take pride in their behavior "is what it's all about," according to Kroll.